For those who can't see it as Pink & white, an experiment based on my recent experiences looking at it. Look at the shoe laces, perhaps think about how they are stained, soda got dropped on them, they're normally nice and white, then visualize them being cleaned and bleached, turning whiter and whiter, as you stare at them. Keep staring at it visualizing white shoe laces and think about how the shoe is also pink hiding under a dye, that any flash of pink you see is part of the true color. ETA: and just now making it switch using this method, even after some practice it took about 20 seconds of staring to get the mint&grey to white&pink flip, so give it a minute or so before giving up. I can swap between both but I saw the mint/grey first. To see the pink clearly, it helps if I mask off anything outside the photo - for example putting some pieces of dark paper surrounding it like a frame and hiding the white background. Yes, if you put it on a field of green and/or blue background, then I can see it as pink and white. This one really messed with me. It's so impressive how much your brain interprets what you see. 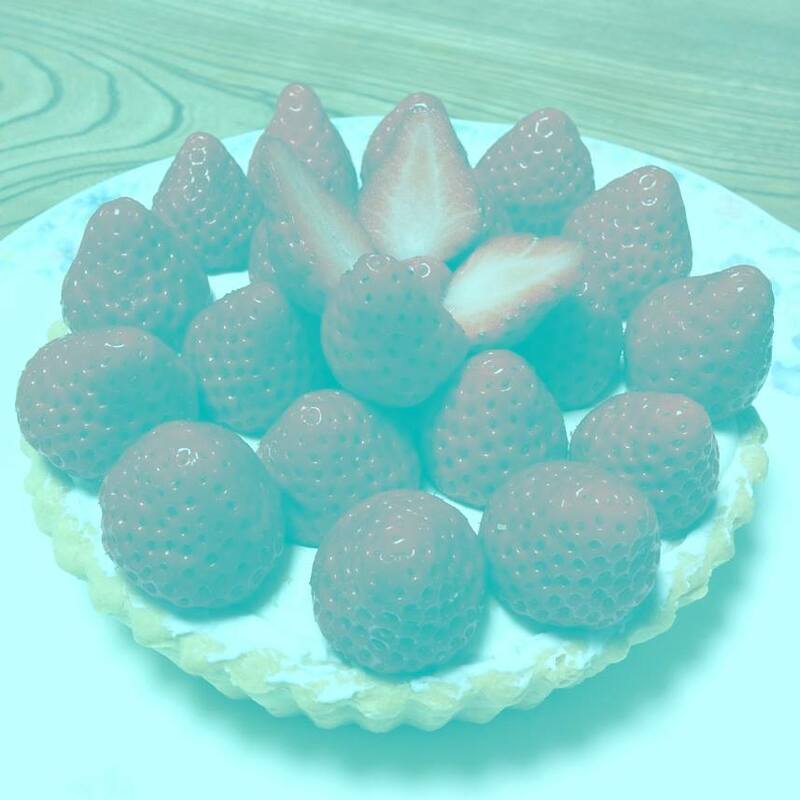 So, I zoomed in on some of the strawberries, so that I couldn't see the white reference (the cream), then I unfocused my eyes so I could force myself not to recognize the image as a strawberry, and then I can see the image as grey. The instant I recognize the image as a strawberry, they go red again. 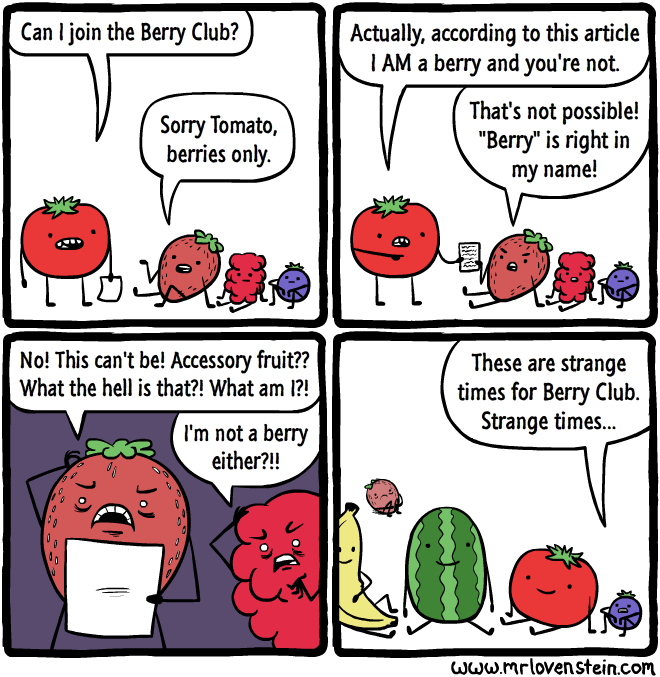 Also, the strawberries are not berries. For some reason I find that hilarious. It only works when its small for some reason. In the process of that last bit, I noticed that I also perceived the grey part of the page surrounding the photo as having a rosy or pinkish cast. It is weird. When he introduces the ruler it gets really crazy. This works exactly as described for me. Even glancing back and forth between the two can make the middle one switch direction mid-rotate. Edit: If you time it just right you can make the middle one just swing her leg back and forth rather than around in a circle. Also, by looking back and forth at various speeds sometimes the middle one will be going in a different direction than the one I'm looking at for just a split second before matching direction again. However, I'm going to go with "no, they aren't"
The "green" areas are around 0,255,155 - close enough to what they claim. The blue/turquoise areas are around 22,240,190. And they vary a lot. This is probably because of a huge amount of blurring due to JPEG and/or other compression. Both "green" and "blue" are 0,255,150. 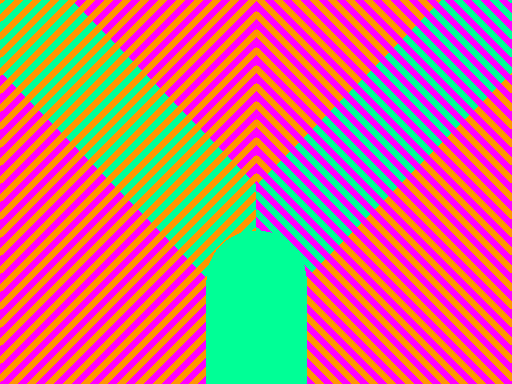 I made this variation which (perhaps) makes it clearer that there are only three colours in the image: magenta, orange, and teal.